Hi everyone! 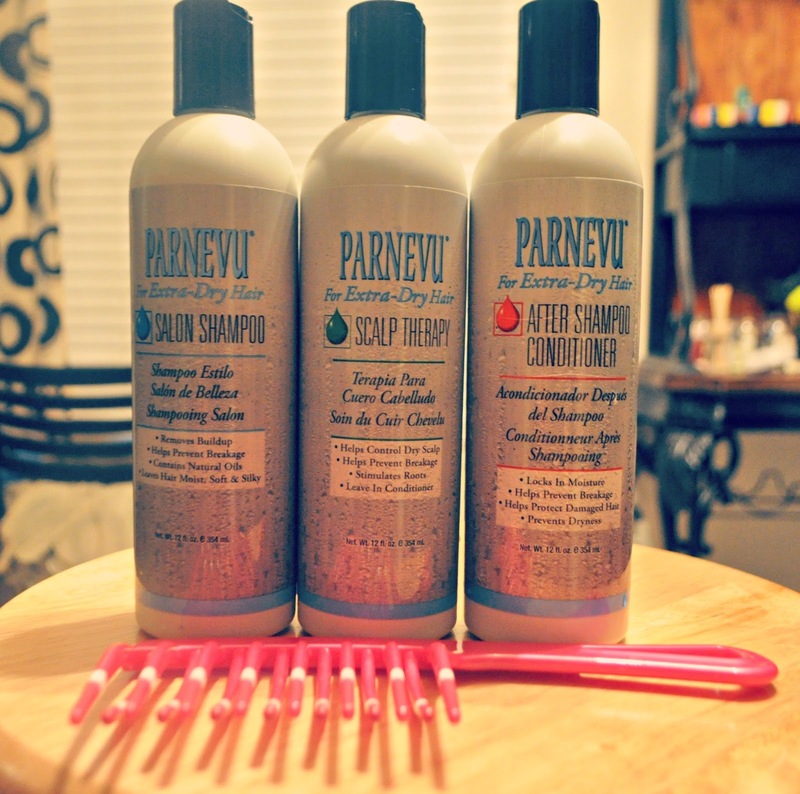 I recently had the opportunity to try out three products from the Parnevu Extra Dry Line, and I chose the Salon Shampoo, After Shampoo Conditioner, and the Scalp Therapy. I figured you guys had seen enough of my hair, so I decided to display the review on my sister's hair, but I also tested out the products on mine as well. my sister has been transitioning since December '13, and her hair hadn't been washed or detangled for about 2 months. She's in the fourth grade, and her hair still accumulates a lot of dirt from recess and exercising during the week. PARNEVU Extra Dry Salon Shampoo: The shampoo had a light consistency, and suds. It didn't strip her hair, and I found it to be very moisturizing, Although this shampoo contains sulfates, I could've sworn it didn't, while I used it on her hair and mine. It also cleansed her hair thoroughly and left no build up. PARNEVU Extra Dry After-Shampoo Conditioner: This one my hair absolutely disliked, but my sister's transitioning hair really liked it. I was inspired to try it on hers, mostly because the product just has that texture that lets you know it would work on smoother or finer hair, and her's is definitely smoother compared to mine, and of a finer texture. It easily detangled her hair, and I was impressed with how the comb glided through, because detangling is hardly a breeze when it comes to her hair. PARNEVU Extra Dry Scalp Therapy: This one was both our favorites, it was super moisturizing, had a ton of slip, and she sad her hair felt like cotton candy. and mine felt great. It is originally meant for the scalp, and I did try it on mine while my scalp was severely itchy, and it helped a lot, but sadly the next day I had a ton of build up. So we started using it as a leave in on the length of our hair instead. The shampoo and conditioner did smell like a neutralizing shampoo, which I didn't like, but I did love the smell of the Dry Scalp Therapy. My intention was to deep condition her hair after rinsing out the conditioner, but the line was super moisturizing, that I ended up applying the scalp therapy as a leave in, and sealed with a mix of amla and argan oils.